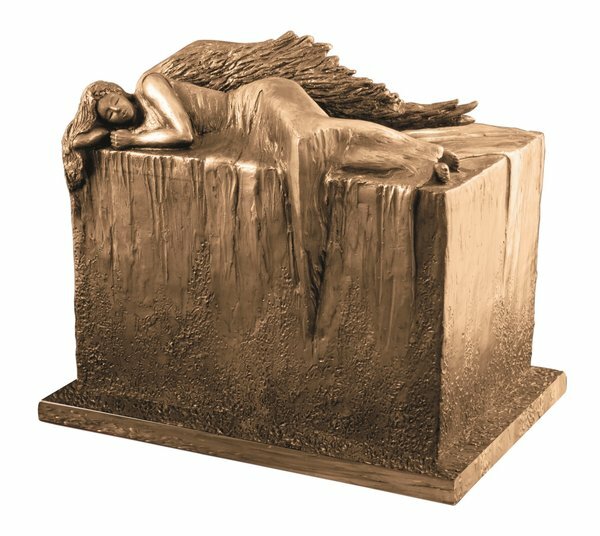 Our outdoor angel urn is an art form that is built to with stand the elements. The urn itself is cast in stone before being finished by artists in your choice of solid bronze, cast iron or copper to give a robust and weatherproof finish. The urns are then passed through a reinforcing resin to give them a sheen and added UV protection for an added guard against both rain and sunshine. The angle urn stands at 27cm tall and 34cm wide with an extra large capacity of 8 litres, making it suitable for more than 1 sets of ashes. The urn is accessed through an aluminium screw plug at the base, to keep it as discreet as possible. This also means the urn can be accessed once sealed, if more ashes are required to be added. The angel urn will be at home both as a garden feature or a memorial indoors and comes with 100% satisfaction guarantee plus free delivery from UrnsForAshes.